Clearly not fulfilling the duties of the job, Kirstjen Nielson tweeted her terse, sans salutation, 2-page letter of resignation as Secretary of the Department of Homeland Security to the President of the United States. With lightening speed, making it clear this much needed change was in the works, President Trump then announced that Kevin McAleenan, the current U.S. Customs and Border Protection Commissioner, will become Acting Secretary Of the Department. Nielson appeared at the border with President Trump during a Friday visit to Calexico, California, as the president pushed for more strenuous efforts to curtail the indefensible surge of illegals and reiterated the urgent need to complete the border wall. Funding for the national security imperative is being withheld by congressional Democrats, whose hatred for the president overshadows their commitment to the safety and security of the United States. Illegal border crossings are at an 11-year high. 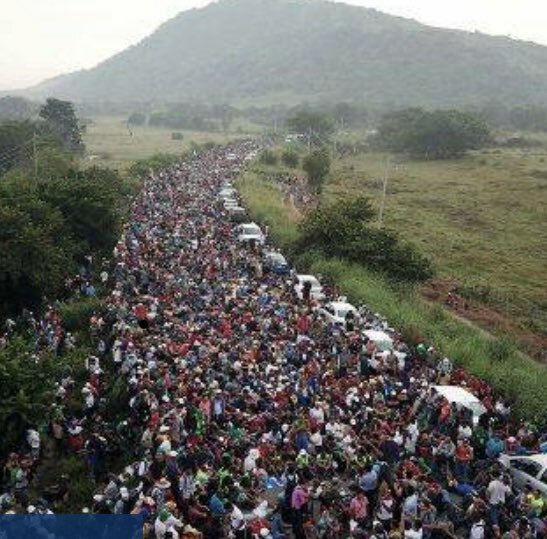 Brassy Central Americans, traveling in massive caravans, have replaced single Mexican men as the bulk of illegal border crossers, more likely to enter covertly. Central American invaders, from El Salvador, Honduras, and Guatemala, coached by lawyers representing them, claim to be families, with children in tow — not necessarily related to the adults — who use them to claim refugee status. They confidently surrender themselves to Border Patrol or I.C.E., which are now forced to release them since they are filled to capacity and unable to process them. The illegals are given a court date at which they never appear, since they are relocated in states far from the border and reliant on taxpayer supported benefits. Border security officials estimate the number of foreign nationals violating our sovereign southern border could reach 1 million by the end of 2019, according to what is likely an under-report by far-left ABC News. Federal officials estimate illegal crossings have exceeded 95,000 in March and will reach 100,000 in April, putting 2019 on track to reach numbers not previously seen. Mexico, whom we are repeatedly told is our valuable trading partner and “neighbor” to the south, has assisted these human caravans, allowing them safe passage to the United States. Whether Mexican or Central American, they are fulfilling their overarching pledge of Aztlan Reconquista (not recent but still relevant video). Vijayakumar Thuraissigiam is a native and citizen of Sri Lanka and a Tamil, an ethnic minority group in Sri Lanka. After illegally crossing into the United States, he was arrested 25 yards north of the Mexican border, and placed in expedited removal proceedings. He was referred for a credible fear interview after he indicated a fear of persecution in Sri Lanka. An asylum officer determined that Thuraissigiam had not established a credible fear of persecution. A supervisor approved the decision, and an immigration judge affirmed the negative credible fear finding in a check-box decision and returned the case to the U.S. Department of Homeland Security for Thuraissigiam’s removal. Then Thuraissigiam, who presumably neither speaks English nor possesses a law degree, filed a habeas petition in federal district court, arguing that his expedited removal order violated his statutory, regulatory, and constitutional rights. Imagine that! Invaders have constitutional rights to invade our sovereign United States of America. How many American citizens would be knowledgeable enough to file a habeas petition in federal court? Read the bizarre opinion HERE. The case was appealed from the U.S. District Court for the Southern District of California. The presiding District Judge Anthony J. Battaglia (age 70) is an Obama appointee. Ninth Circuit Judges A. Wallace Tashima (age 84), M. Margaret McKeown (age 67) and Richard A. Paez, (age 71) were all Bill Clinton appointees. Tashima, who wrote the opinion, was previously appointed in 1980 to the U.S. District Court for the Central District of California by Jimmy Carter. These leftist judges who put illegals above American citizens present clear and convincing evidence why President Donald Trump’s court appointments are so significant. His impact on the U.S. Supreme Court has been spectacular. It is also why the Democrats are chomping at the bit to impeach him. Lindsey Graham, a dedicated McCain loyalist, can’t figure out which way he swings without his good buddy to accompany him down the dark senate corridors, while whispering not-so-sweet nothings in his ear. Now he advises Trump to cut a deal with the intransigent leftists. Appearing on “Fox News Sunday,” (video) Graham urged the president to reopen the partial government shutdown for three weeks to allow lawmakers to negotiate. As Graham pursues an agenda markedly different from the conservative, Trump-supporting base — pushing the farcical DACA and expanded Temporary Protected Status currently estimated to exceed 400,000, it’s important to remember exactly who Lindsey Graham is. Graham is obviously not someone Pres. Trump can rely on. His advice is worthless. With friends like Lindsey Graham, who needs enemies? Nancy Pelosi is frozen in time in more ways than her overly nipped-and-tucked, botoxed face. She has now declared that she has the answer to securing our southern border — by implementing technology rather than constructing a physical barrier and utilizing trained border agents. She obviously has no commitment to curtailing the invasion, since leftists look at these lawbreakers as the future heft of the Democrat party. We’ve all witnessed Nancy’s mental lapses, but this latest blunder should have at least caught the attention of her aides, who could have righted her listing memory. This SRAZ post, “Virtual fence is a virtual flop,” was written nearly a dozen years ago, but couldn’t be more timely. As we wrote at the time, the entire high dollar project ended up being scrapped, due to the clumsy incompetence of the Bush administration’s Homeland Security Secretary, Michael Chertoff, the contractors and the failed system itself. Chertoff, a former federal judge appointed by George W. Bush, was a Hillary Clinton supporter in 2016 and currently works at Covington the same law firm with a massive lobbying presence where former AZ Sen. Jon Kyl and Barack Obama’s onetime Attorney General, Eric Holder, each hang their hats. …And besides, it’s just taxpayer’s money. There’s more where that came from. And truth be told, Democrats have no desire to stem the tide of illegals.